Blame Canada…that my pants don’t fit. The phrase “I can’t complain” has always confounded me. When pressed, I could always complain about SOMETHING. Like, right now? I’m laying on the couch. It’s very relaxing. …but the clock is ticking a LITTLE bit loudly. It’s mostly a goof, but it’s rare to find something you can’t complain about AT ALL. Humans, by nature, are complainers. And this GD clock is so loud I’m going to murder it. 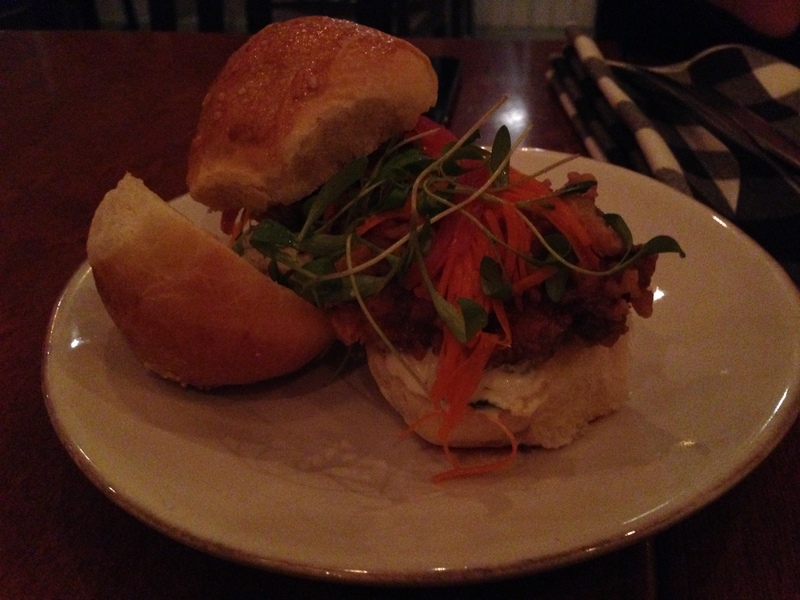 But one thing I don’t think I can find much to complain about is the food scene in Toronto. I spent a week there shooting a spot (for those not in the biz that’s a “television commercial.”) And it’s just silly the variety of food that they have up there. While it sounds incredibly glamorous (Callbacks! Lights! Fake Snow! ), a lot of the reality of production is more like this: Emails! Phone Calls! Room Service between Emails and Phone Calls! So one of the most exciting treats of being on production is getting to go explore a city’s food culture. And I could not complain. Well, I COULD….it was very cold. First amazing meal? Acadia on Clinton Street. The restaurant was surprisingly empty when we went, apparently a common occurrence due to just how many restaurants there is. (Things pick up later in the week, too.) But the food was spectacular. Piping hot cornbread with bacon butter, mini oyster po-boys, with a main of hominy, mushrooms truffles and a slow cooked egg. It just spoke to me. And the words were magical. Next amazing meal? Bar Isabel on College Street. But the meal to top all meals was at Buca. My friends Jon and Dennis had told me about this place back when I was up in Toronto in April, but we couldn’t get a reservation. But we got one this time. OH YES, WE GOT ONE THIS TIME. And despite me trying to get us lost on the way there, I had one of the most interesting meals evar. We started with crispy pig’s ears. If you are a lover of pork and you have never had crispy pig’s ear’s than your pork card is getting revoked. (What does that even mean?) They’re crispy (obviously), but they’re also tender. It’s like a chicharon, only softer. It’s out of this world. Get some now. We split two amazing pizzas—one with truffles and one with a bunch of mushrooms. Delicious. And my main was insane. I got something I’d never had before and it was delicious. I got the ravioli doppi, which is a double stuffed ravioli. One half of the ravioli was stuffed with goose. 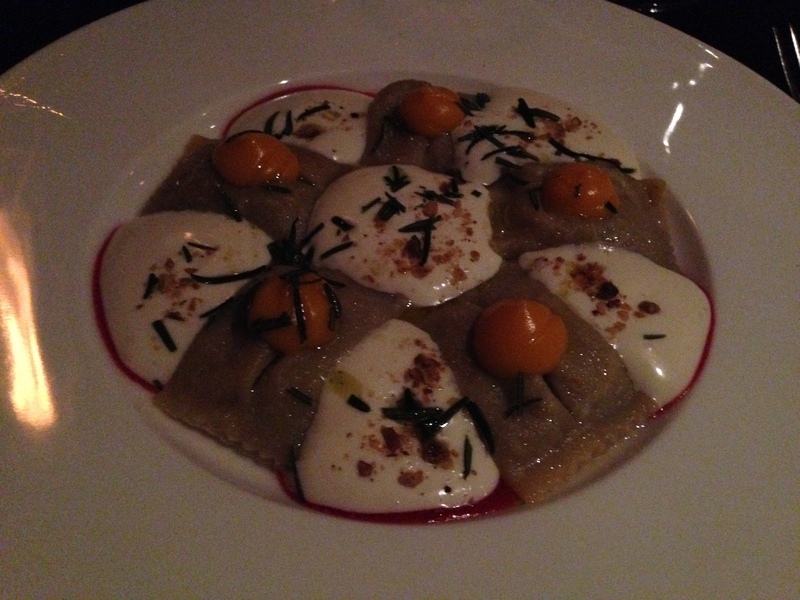 The other half of the ravioli was stuffed with butternut squash puree. The whole thing was accompanied by a parmesan espuma (foam) with rosemary and a hazelnut brittle. This has got to be one of the best things I’ve ever eaten. The gamey/oiliness of the goose was balanced wonderfully by the sweetness of the butternut squash. The parmesan espuma gave sharpness. And man, that ravioli was cooked perfectly. It was an amazing meal. It was an amazing trip. And I could not complain about it at all. Because it had to end.